Last year there were rumors about the release of the second generation budget smartphone iPhone SE 2in early 2018, and now there was the first information about the design and capabilities of this model. The other day in the Chinese social network weibo published a photo of the back cover of the yet unannounced Apple smartphone, with special interest not in the design, but in the cover material. 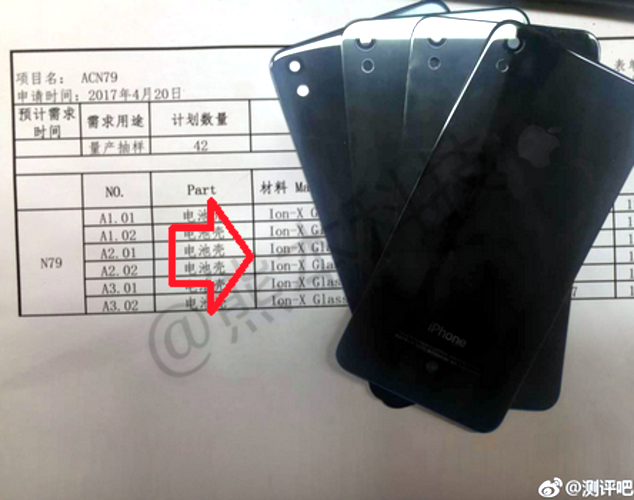 Judging by the appearance of the covers and the documents against which they are photographed, the back panel of the iPhone SE 2 will be made of glass. In this case, according to insiders, it’s not just about unification with the rest of the smartphones of the Apple 2018 model year (iPhone 9/9 Plus, iPhone X / X Plus), which are virtually guaranteed to receive glass covers. Sources of leakage suggest that this fact directly indicates that Apple has decided to add the function of wireless charging, even in the most affordable smartphone. Updated data from the supply chain indicate that the iPhone SE 2 will get a 4.0 or 4.2-inch display, a 12 megapixel main camera and a front 5Mp camera. As a hardware platform will be used quad-core processor Apple A10 Fusion, familiar to fans of the brand for the model Apple iPhone 7 and battery for 1700 mAh. The amount of RAM is likely to be 2 GB, customers will be offered two versions with 32 GB and 128 GB of internal memory with a starting price of $ 400. Recall that the Apple iPhone SE is an update of the best-selling iPhone 5S, it is equipped with the same 4-inch screen with a resolution of 1136 × 640 pixels, but more advanced hardware stuffing based on the Apple A9 processor, twice the amount of RAM (2 GB instead of 1 GB) and other improvements. A year after the announcement, Apple doubled the data storage capacity of the iPhone SE from the original 16 GB and 64 GB to 32 GB and 128 GB respectively, and lowered the cost – prices fell from $ 399 and $ 499 to $ 349 and $ 449.